TCF Bank is the wholly owned banking subsidiary of TCF Financial Corporation, a bank holding company headquartered in Wayzata, Minnesota. As of December 31, 2013, TCF Bank had nearly 430 branches in Minnesota, Illinois, Michigan, Colorado, Wisconsin, Indiana, Arizona and South Dakota. 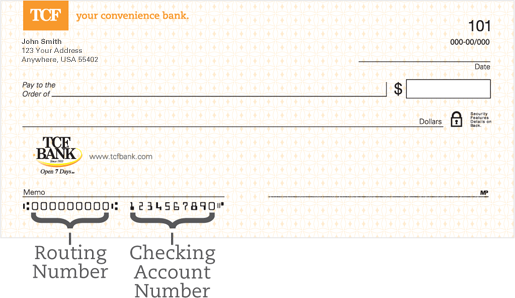 Routing Number for TCF Bank is a 9 digit number occasionally used for setting up direct deposits, check ordering, initiating electronic payments such as domestic wire transfers etc and also known as Routing Transit Number (RTN), ABA Routing Number and ACH Routing Numbers. The best way to locate your routing number for TCF Bank is to look at the left bottom corner of the check of your checking or savings account. If check is not available, then find the routing number based on the state where your bank account was initially opened.